The New York Times bestselling authors of Mrs. Kennedy and Me share the stories behind the five infamous, tragic days surrounding JFK’s assassination, published in remembrance of the beloved president on the fiftieth anniversary of his death. Clint Hill will forever be remembered as the lone secret service agent who jumped onto the car after President Kennedy was shot, clinging to its sides as it sped toward the hospital. Even now, decades after JFK’s presidency, the public continues to be fascinated with the Kennedys—America’s royal family. To mark the fiftieth anniversary of President John F. Kennedy’s assassination, Hill recounts his indelible memories of those five days leading up to, and after, that tragic day in November 1963. Hill, as Jackie’s guard, experienced those days firsthand. Hill provides a moment-to-moment narration evoking the feelings and emotions behind the images—clearing up the persistent conspiracy misconceptions along the way. 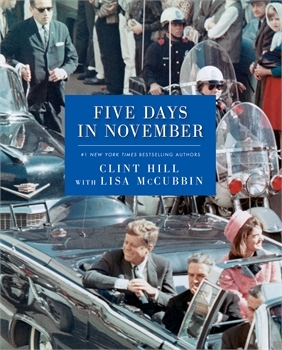 Told movingly by a man who still wishes he could undo it all, Five Days in November is a rare and deeply personal look at the assassination that affected the entire world and changed the United States forever.